Continue to run Windows within the QEMU emulation as I was already doing. Run Windows by switching disk drives each time I wanted to change operating systems. Run Windows by booting from an external hard drive connected via USB. Install a new, larger disk, install both operating systems, and change operating systems with the primary boot loader. * I used OpenBSD on a laptop from around 1999 until 2017. It started as a way to force myself to know a more secure UNIX variant on very low-end used laptop hardware. The constant changes and toxic atmosphere drove me away. Choice #1, using QEMU, just didn't provide acceptable performance. Choice #2 wasn't acceptable. I would quickly lose some of the small screws, and how long after that until the SATA connector or cable became intermittent? Choice #3 seemed attractive at first. Despite the Windows installer refusing to install onto USB media, there are ways to accomplish this with scripted installers. You need a machine already running Windows 7, the Windows Automated Installation Kit (a free download from Microsoft), and fujianabc's explanation and installer bundle. Yes, I was able to make an external drive that boots and runs Windows, not just a portable installer that so many pages offer instead. 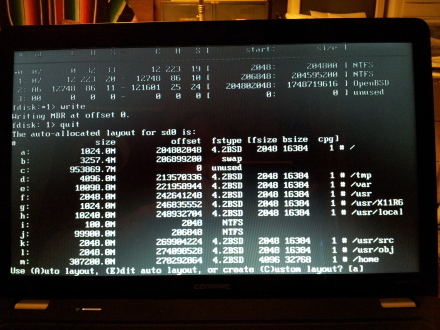 However, I had to create it somewhere other than my OpenBSD-only laptop, and it would always fail with the notorious 0x0000007b Blue Screen of Death on my laptop. Something about the different USB chipset, I think. But that was just fine, I really didn't want to have to carry any extra hardware. If I'm only going to run one OS at a time, it would be better to do it off the same hardware. Meanwhile, my 8-megapixel camera was filling my laptop's disk space. Its original 320 gigabyte disk just wasn't big enough. My plan was to install a new, larger disk, install both Windows 7 and OpenBSD, and set up the boot loader to select between the two. I would use the Windows boot loader because it would do what I needed and any clueless Windows "restoration" of the boot loader during a Service Pack or other update would cause no harm. The laptop would run a Microsoft product for 10 seconds at each boot, and then usually default to a better operating system. Make sure this is done correctly before proceeding! Fortunately, this is easy. 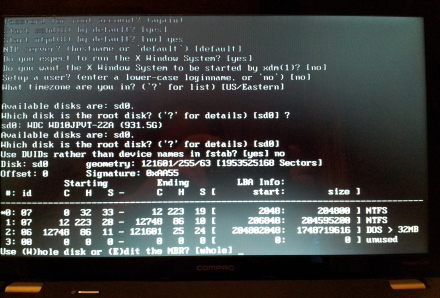 Plug an external drive into a USB port and do what you see in the command prompt here. That file package-list will be useful later. The mount syntax assumes that there is one internal SATA disk, which will be sd0, and you just have the one USB drive connected. The df and du make sure that there is enough space. 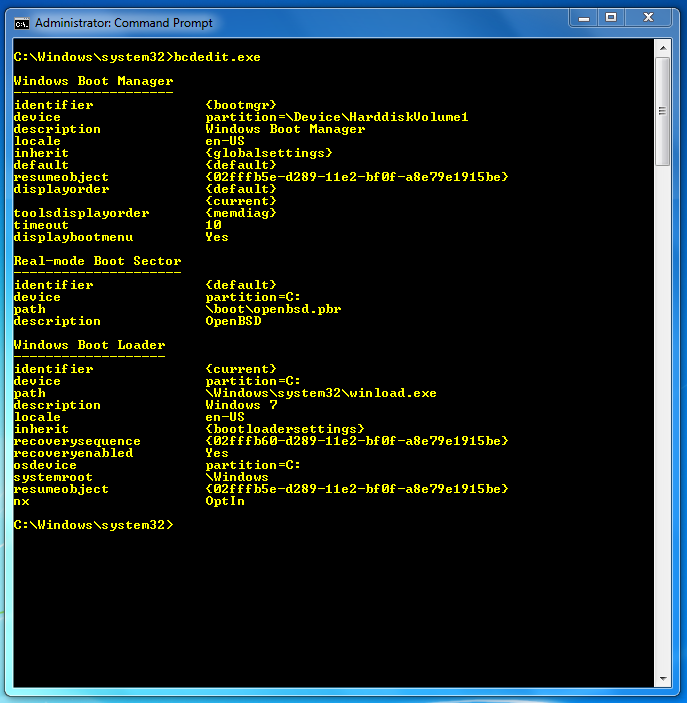 Using gtar instead of the default /bin/tar can help if any unusually named files are involved. The echo checks the exit status of the archive creation, you want to see a "0" here! As an alternative, you could use the tar over ssh trick to back up the data across the network. Shut the system down and install the new disk drive. What to do with the old drive? Set it aside in a safe place for now. You could always switch back to the old disk if things don't work out. When you are absolutely certain that you have your data installed onto the new hardware, you can either beat the old disk with a large hammer or install it in an external drive enclosure and continue to use it. Remember that dd and /dev/zero can help you sanitize the old disk before continued use. 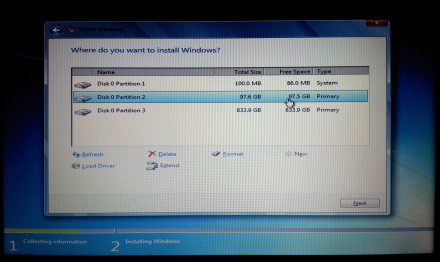 The disk just has two partitions so far, the System partition for the boot loader and the second for Windows. Format the first two partitions. The third partition will be used for OpenBSD. In the first picture above you see what happens when you tell the Windows installer that you want just one 100,000 MB partition for Windows. It gives you that, but first it insists on a 100 MB partition for the boot loader, labeled here as "System". At right I have taken the next step and told it to go ahead and put the rest of the disk into an unused partition. I will tell it to go ahead and format the first two. 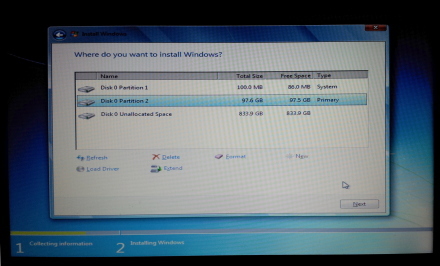 Windows starts counting disks at #0 and partitions at #1. So we're looking at the first, second and third partitions on the first disk. I was curious. 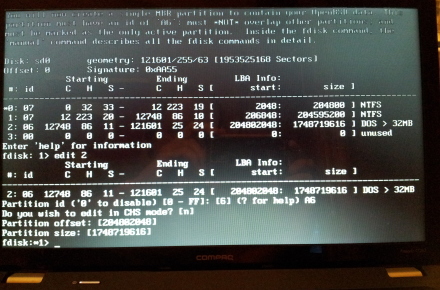 What's in that mysterious System partition? This is the minimally bootable system. Windows 7 supports BitLocker, commonly called "whole-disk encryption". But if the entire disk was encrypted, the system could not boot! So BitLocker is really "almost all of the disk encryption", except for the boot block itself with the MBR, this 100 MB "system partition" with the boot loader and kernel, plus any non-Windows partitions. You can assign a drive letter to this partition, but by default the Windows installer does not. So, this isn't seen from within Windows, which thinks that its C: drive is the first one on the disk. 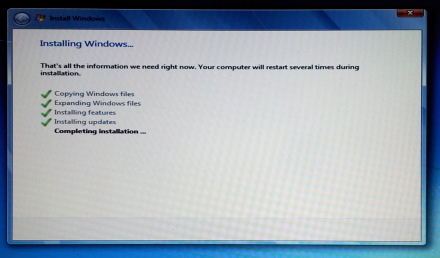 Back to the Windows installation process. Let the installer crank along. It copies, decompresses and installs files from the DVD onto the new file system on the new disk. When it gets to "Completing installation" it's pretty close. Wait for the files to be copied to the disk. The installer will close soon. Remove the DVD so the system boots from the disk. When it starts to reboot, remove the DVD so it boots from the disk. The precise sequence of events is not critical, I figured that I might as well go ahead and let it boot Windows from the new disk for its initial boot and the rest of the setup. 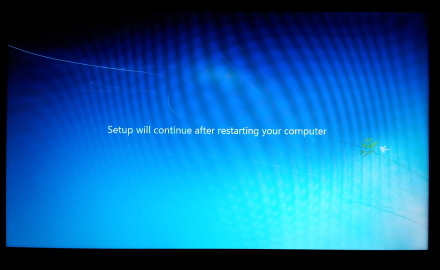 That way, if anything went wrong in the Windows setup and I had to start over, I would be wasting less time. 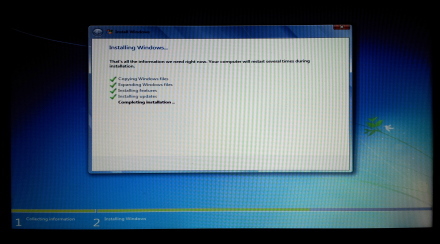 OK, Windows is installed, on to the next operating system! I booted with the relatively small CD media OpenBSD uses for online installation. Comcast provided about 21 Mbps download and 5 Mbps upload speeds when I did this, so I didn't mind waiting for the installation to download. We need to change the label on the third partition. Enter E to edit the MBR. After the initial questions we get to the disk details. Windows said the one disk was Disk 0 with partitions 1, 2 and 3. OpenBSD says the one SATA disk is sd0 with partitions 0, 1 and 2 (plus, potentially, 4, although a fourth partition has not been defined). Multiply the size column by 512 to get bytes, or divide by 2048 to get megabytes (or, strictly speaking, mebibytes). Notice that partition #3 has an ID or type of 0x06, meaning "DOS > 32MB". We need to change this by editing the MBR. Enter E to edit the MBR. 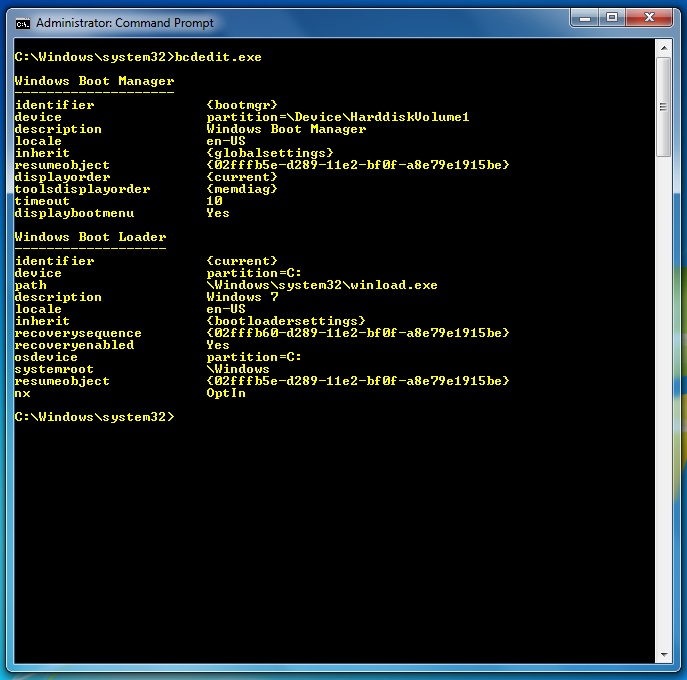 It will show you the partition table so far, and you can always use the print command. Enter edit 2 to edit the MBR. It starts by asking for the new partition ID. Enter A6 for OpenBSD. Then simply press <Enter> to accept the defaults: we don't want to edit anything in CHS mode nor do we want to change the partition's offset (starting point) or size. Enter edit 2 to edit partition 2, then 0xa6 means OpenBSD. Verify that you modified it correctly. Enter print to verify that it worked. THis looks good, notice that partition #3 has been changed from 0x06/DOS to 0xa6/OpenBSD. Enter write to save your changes to the disk. Then enter quit to exit the partition table editing. A standard OpenBSD installation uses the entire disk and creates a disk label to carve this up into slices, one for each file system plus a swap device. Here, we are putting OpenBSD into a partition. It will divide that partition into slices with its disklabel tool. This automatically allocated layout is OK as a starting point. Above we see its automatically allocated layout. This isn't precisely what I want, it is only using about a third of the disk. But I want to use all the spare space for /home and that is the last slice on the disk. Look at the offset field, /home has the largest offset. This means that I can expand that partition and file system later. Press <Enter> to accept this automatically allocated layout. Then it's just a matter of telling it to retrieve the installation over HTTP, setting the root password and time zone, and so on. at the boot prompt. But let's fix the Windows boot loader first! Got it? Good. Now we're ready to modify the Windows boot loader. Reboot and let it bring up Windows. 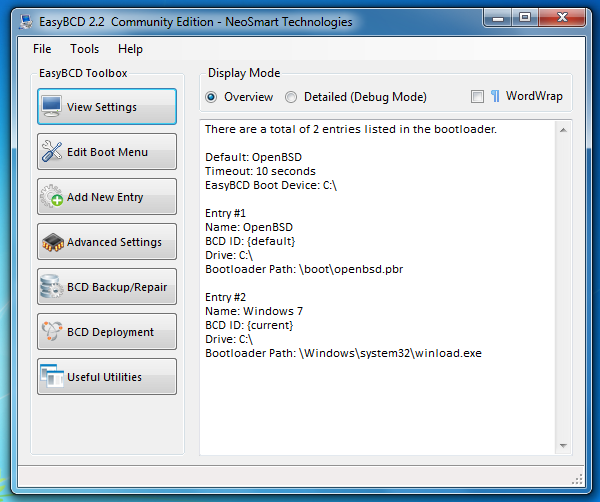 Starting with Vista, a Boot Configuration Store or BCD data store controlls the boot logic. Instead of editing the text boot.ini you run the bcdedit command-line utility. 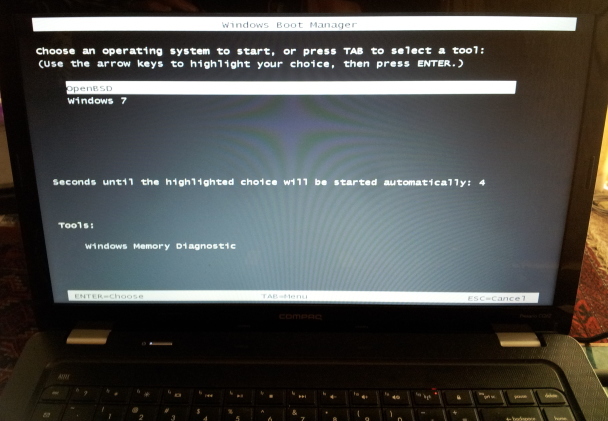 The precise syntax needed varies, this page shows you how to multiboot OpenBSD with Windows 7. For Vista or Windows 8 or another version, see the OpenBSD Installation Guide. 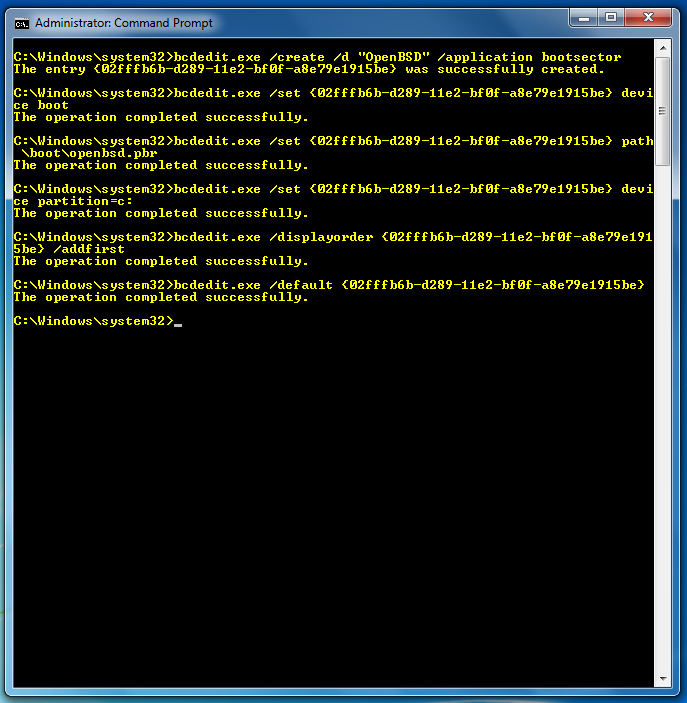 Here we see the Boot Configuration Store as it exists right after the two operating system installations. Of course, Windows has no idea about the second one. Here is the very Windows-7-specific syntax for adding a second bootable operating system, calling it "OpenBSD", referring to c:\boot\openbsd.pr, and making it first in the list and the default. to shorten the time from its default 30 seconds to 10. Note very carefully that you must read the output of the first command, and then use the GUID that you get for all the other commands in place of the GUID you see here. Let's make sure that's clear. The syntax of these commands is correct but you must change the GUID from my 02fffb6b-d289-11e2-bf0f-a8e79e1915be to the unique value you see in the first command's output on your system. Let's use the bcdedit command to see what we got. 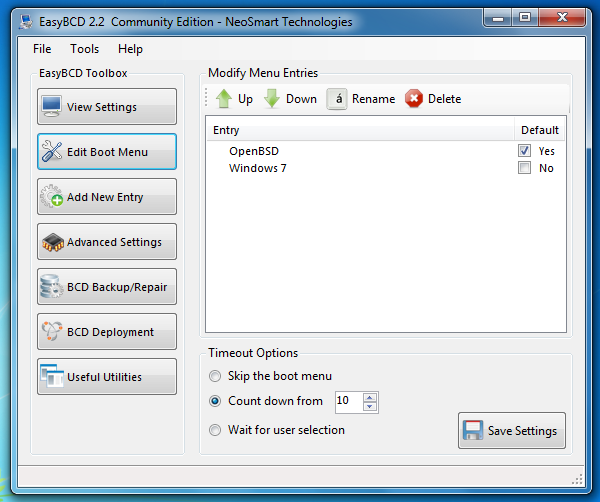 The graphical EasyBCD command is available. As so often happens when comparing graphical to command-line tools, EasyBCD makes simple tasks easy, but more sophisticated tasks get much harder or aren't even possible. At least with EasyBCD version 2.2, the latest available when I first did this, OpenBSD wasn't really supported as one of the non-Windows operating systems. It can, however, present what you already did with the command-line interface. Simpler tasks are possible with EasyBCD. You can easily change the order in the menu, change the default choice, or change the timeout or simply wait until the user selects an operating system. Well, at least as far as the multi-booting. I still need to do a few things on the OpenBSD side. First, enlarge that last slice m.
Then, expand the /home file system mounted there. After that, install the same set of packages we had on the previous system. Then, recreate my user account and install my files. Use the disklabel command to edit the OpenBSD disk. Use the -E option for "edit". Use the p command to print the existing table. Use the c m command to change slice m.
It tells you the maximum size, but by default it makes no change. You must type in the desired size. Notice that you can use p m to print the table with the sizes in megabytes instead of sectors. You can also use m or g to specify the new size in megabytes or gigabytes, but things get rounded off. Since I wanted to use all the space, I simply specified all the possible sectors. Write the changes to the disk label with w and then quit with q. The slice is larger, but now you need to grow the file system out to fill it. Unmount the file system with umount. Use growfs to grow the file system. Run the file system consistency check, mount it, and make sure it worked. Remember that package-list file? That was a list of all the installed packages on the old system. The thing is, I had gone through a couple of upgrades and there were likely some packages that weren't the latest and most fully debugged. So, I want to select packages by name alone and not name and version. Hence the sed command to strip off dash-digit and all following characters. Almost all of the packages with names starting lib* are libraries, of which the appropriate version will be retrieved based on dependencies. I'll keep them out of the list with the grep command. An exception here is the libreoffice package, so I'll explicitly list it. 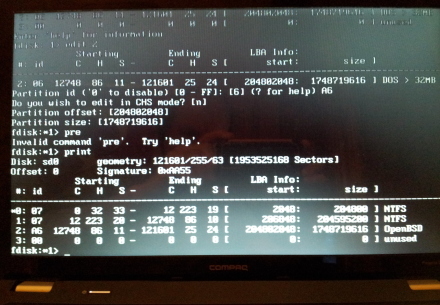 OpenBSD assumes that the hardware clock is set to UTC. Windows assumes it is set to the local time. You can build your own kernel that accounts for this. Or you could adjust an existing kernel. Or you could simply let Windows use UTC.